Jane Richmond's Double Knot technique of joining yarn has really changed my world. 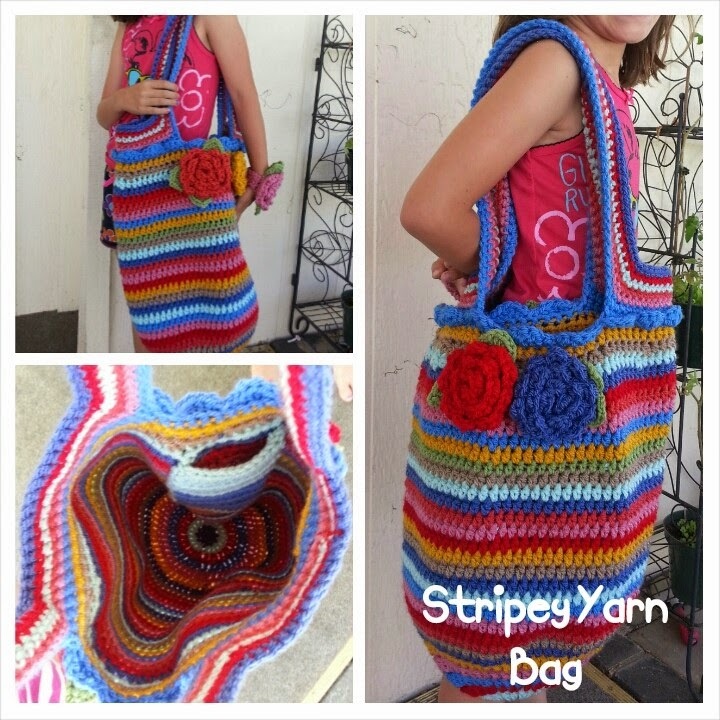 No more weaving in ends! 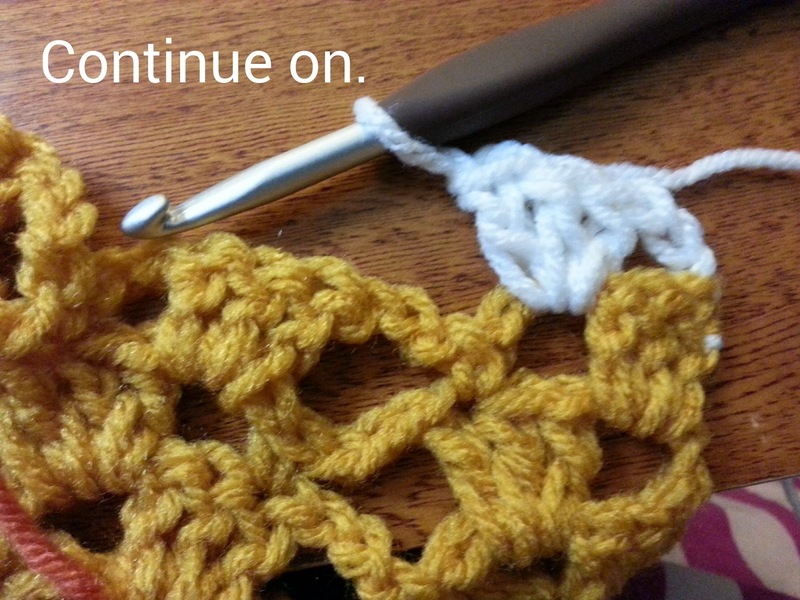 When you are crocheting with the same color yarn, the join is pretty much invisible. But what happens when you want to switch colors? It took me some trial and error, but I figured out how to change colors. 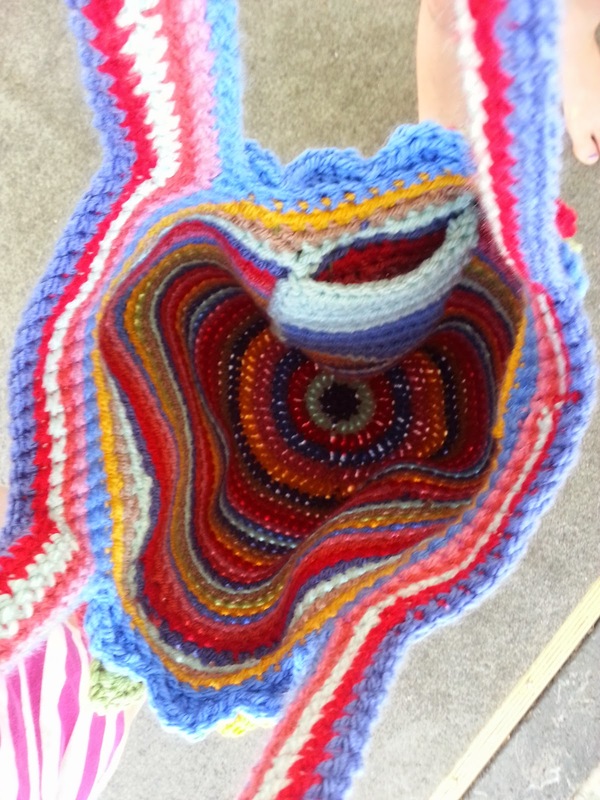 Once I did, I was able to make a bag for my projects only having to weave in the first tail and the last. 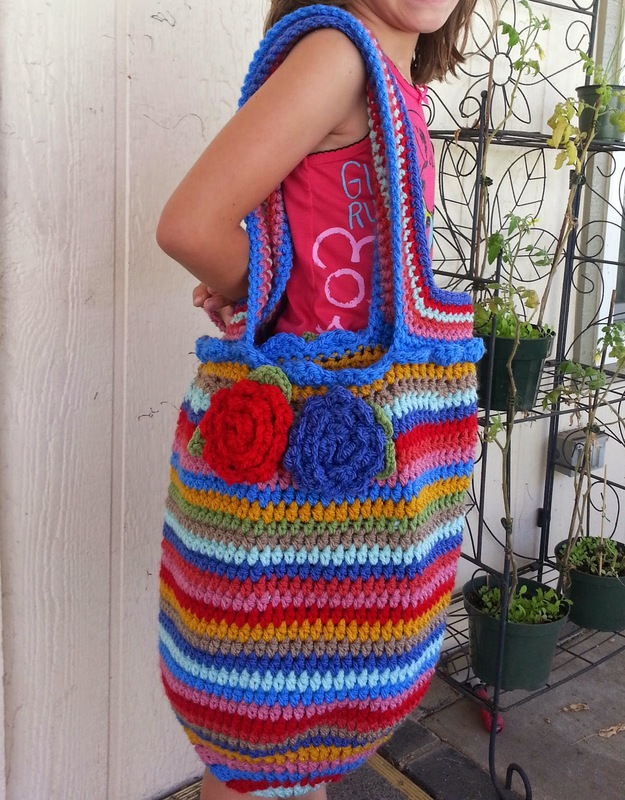 I changed colors every row for 25 rows of that bag and I only weaved in two tails! 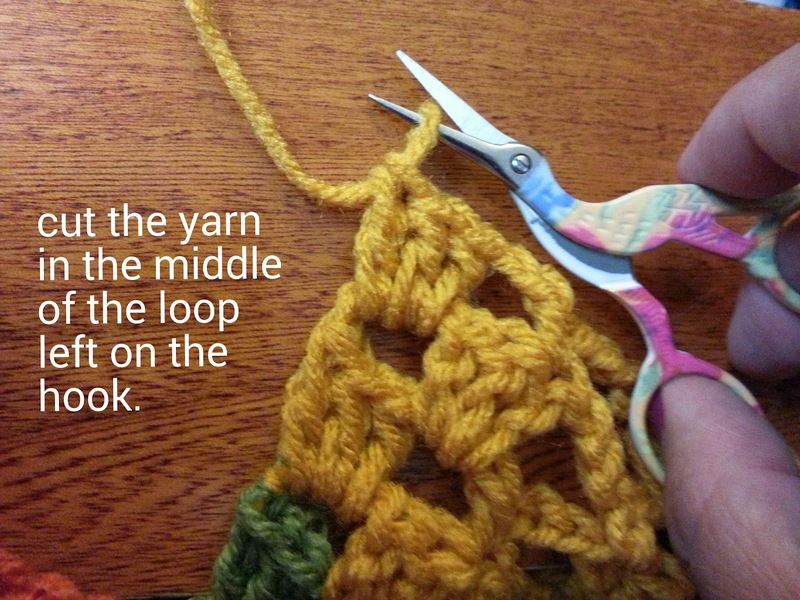 1) Crochet (and complete) to the last stitch in your current color. 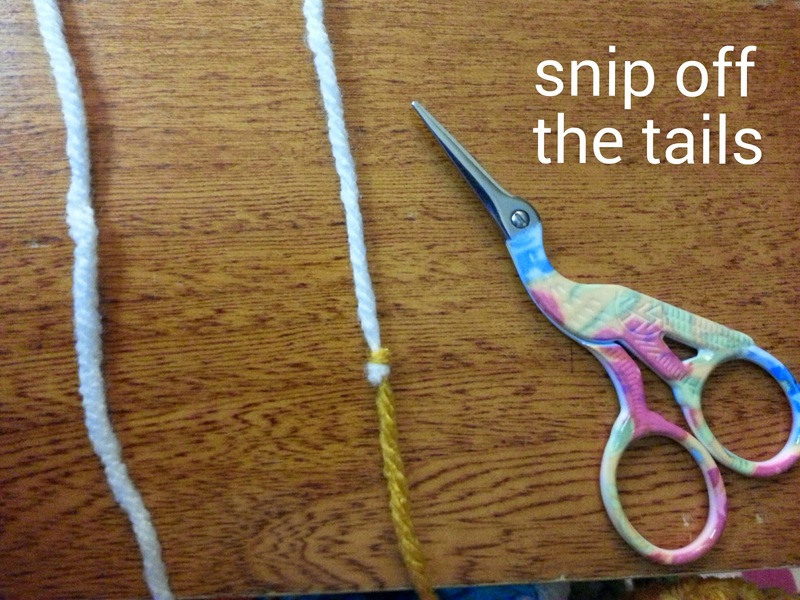 2) Snip the yarn right where it is on your hook. This makes certain that you only have the amount of your current color that you need before the color change. Put your hook aside. 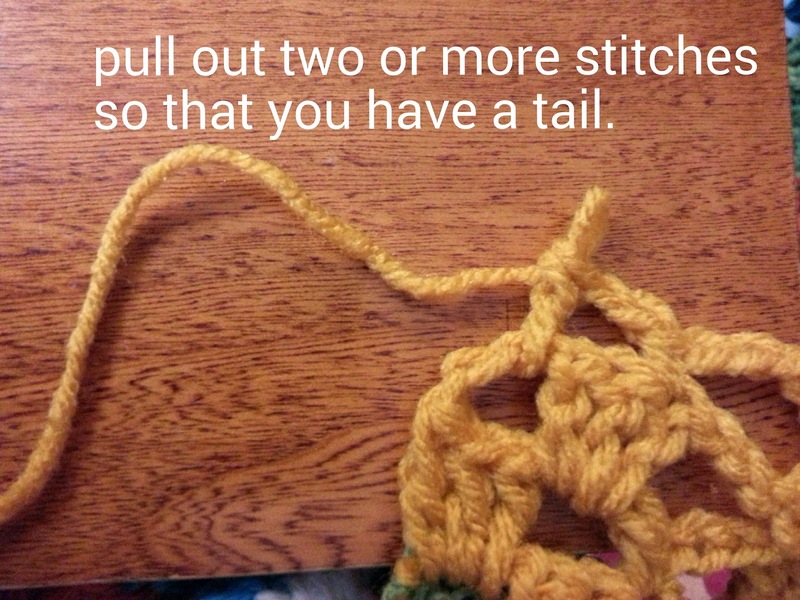 3) Pull out one or two of your stitches to give you yarn to work with. 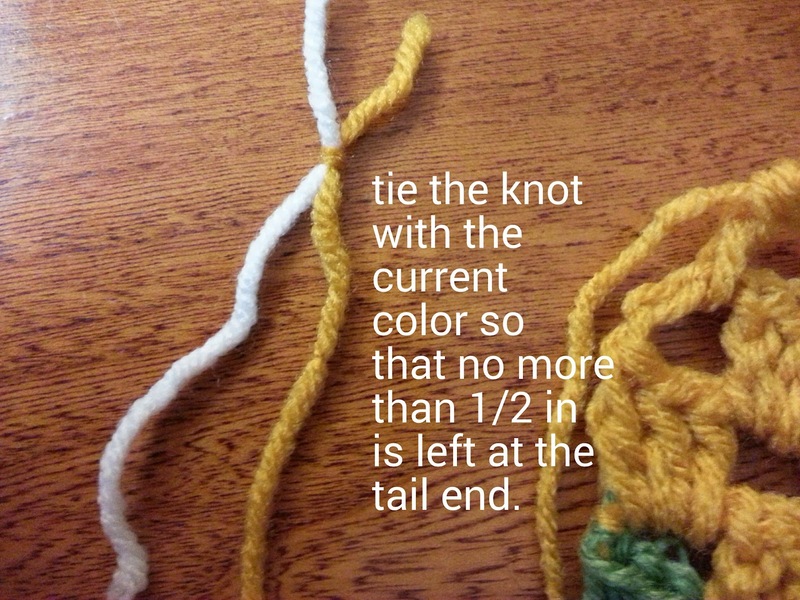 4) Join the new yarn to the end of your current color, making certain that the knot of your current color is as close to the end as possible. I can generally work it so that I only have about a half an inch of excess. 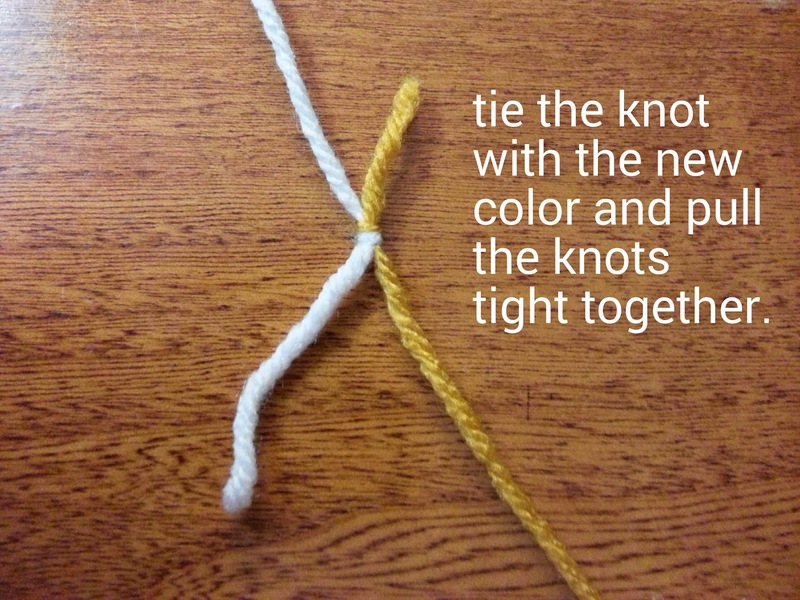 5) Complete your knot, snip off the ends. 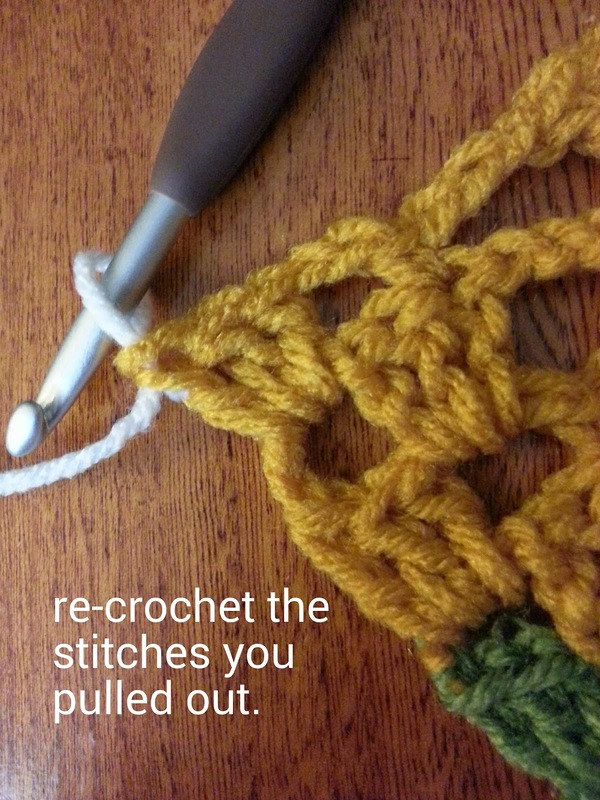 6) Reinsert your hook and crochet back the stitches you took out. The new color should come up right at the point you want it to start! I'm not worried about that speck of white on the side, because I'm planning on including a border. 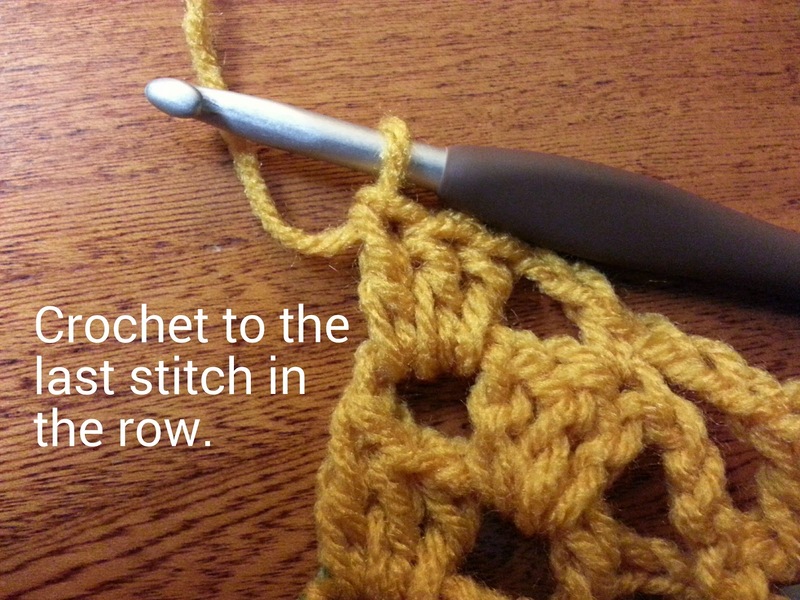 However, I've learned that you can pull your stitches back out, readjust your tension and crochet the stitches again to make that knot completely hidden by your stitches. 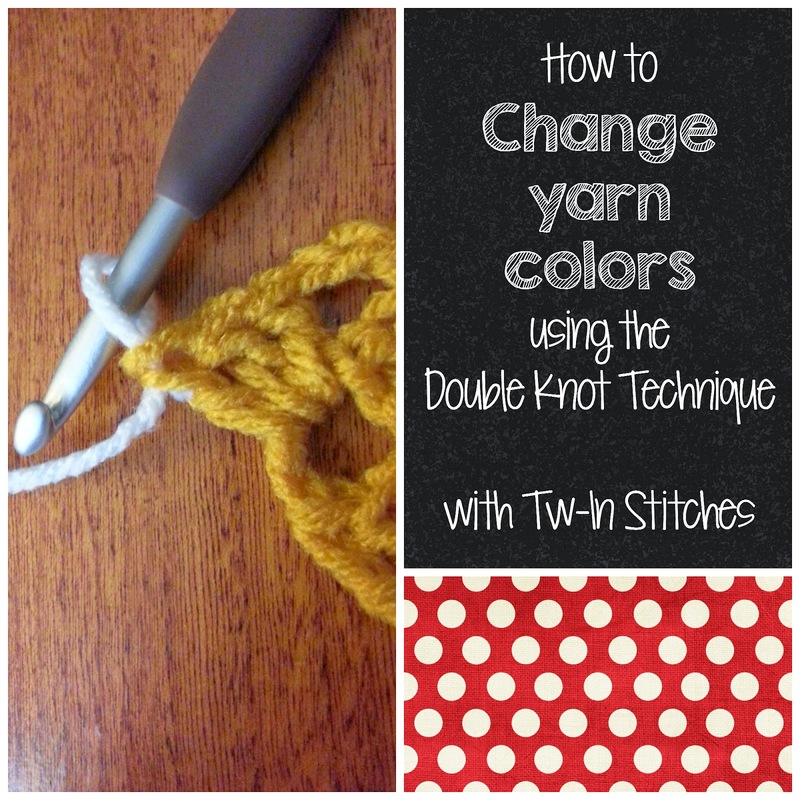 I absolutely love the Double Knot method and I hope you find this method of joining colors helpful!